Unplug the mixer before attaching or removing mixing attachments. Believe me; speaking from experience, it’s not fun to have your fingers in the mixing bowl when you accidently turn it on. 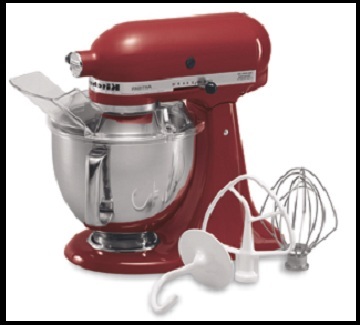 Your KitchenAid®stand mixer will mix faster and more thoroughly than most other electric stand mixers.Therefore, the mixing time in most recipes must be adjusted to avoid over beating and/or over heating the dough. 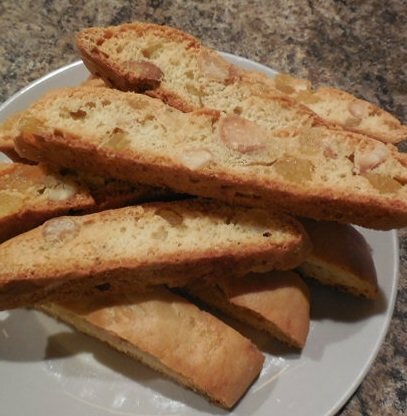 When mixing the dough for Biscotti the mixing time may be half as much, as when mixing by hand or with a less powerful stand mixer. The bowl and beater are designed to provide thorough mixing without frequent scraping. Scraping the bowl once or twice during mixing is usually sufficient. Turn stand mixer off before scraping. This KitchenAid mixer tip is almost as important as the fist. Always add ingredients as close to the side of bowl as possible, not directly into moving beater. The pouring shield can be used to simplify adding ingredients. Follow individual recipes for guidelines on including these ingredients. In general, solid materials should be folded in the last few seconds of mixing on low speed. The batter should be thick enough to keep the fruits or nuts from sinking to the bottom of the bowl during mixing. Sticky fruits should be dusted with flour for better distribution in the batter. Mixtures containing large amounts of liquid ingredients should be mixed at lower speeds to avoid splashing. Increase speed only after mixture has thickened. This is perhaps more than a KitchenAid Mixer Tip but Speed Settings are IMPORTANT. For slow stirring, combining, and starting all mixing procedures. Use to add flour and dry ingredients to batter, and add liquids to dry ingredients. Once started you can usually move to the next highest setting to finish mixing. For slow mixing, mashing, faster stirring. Use to mix heavy batters like Biscotti. Or for cutting shortening/margarine/butter into flour. For mixing semi-heavy batters, such as beating cookies. Use to combine sugar and shortening or butter. To blend in the eggs and other oil to the sugar mixtures. Would rarely be used, because the speed would warm the dough, making it difficult to work with. Tip: I your dough becomes too warm to work with and shape, place it in the refrigerator for a minimum of 1 hour. 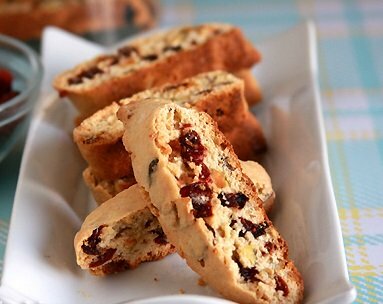 Most Biscotti recipes call for more than just throwing the ingredients in a bowl and mixing the begeebers out of it. To get the right texture you need to follow the recipe and adapt it to the stand mixer in order to have the best results. Over mixing will make for an inferior cookie. I still recommend the two bowl method when using a stand mixer, unless the recipe calls for something different. 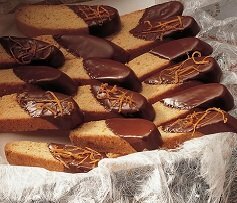 Here are the general procedures, use the one that follow the recipe the closest. In a bowl whisk or shift together the dry ingredient: flour, baking powder or soda, salt, sugar, spices. In the stand mixer,with the flat paddle attachment, mix together the, butter, eggs, zest and extracts. Mix for about 30 seconds. Stop and scrape bowl. Starting with low speed, gradually add the dry mixture to the wet while running mixer on low to medium speed for about 2 minutes; remember you don’t want to over mix. Turn up speed to medium for 30 seconds. Stop and scrap bowl. Add chocolate chips, nuts and/or dried fruit. Mix on low, just until incorporated about 15-20 second. Scrap out of bowl, shape and transfer to prepared baking sheet. Place sugars, butter, eggs, and extracts in mixer bowl. Attach bowl and flat beater to mixer. Turn to Speed 2 and mix about 30 seconds. Stop and scrape bowl. Turn to Speed 4 and beat about 30 seconds. Stop and scrape bowl. Turn to STIR/1 Speed. Gradually add baking soda, salt, and flour to sugar mixture and mix about 2 minutes. Turn to Speed 2 and mix about 30 seconds. Stop mixer and scrape bowl. Add chocolate chips, nuts or what ever. Turn to STIR Speed and mix about 15 seconds. Scrape out of bowl, shape and transfer to prepared baking sheet.